CAIRO -- With nearly all the ballots counted, Egypt's former military chief has won a crushing victory over his sole opponent with more than 92 percent of the votes, according to results announced by his campaign early Thursday. The campaign of retired field marshal Abdel-Fattah el-Sissi said he won 23.38 million votes, with left-wing politician Hamdeen Sabahi taking 735,285. Invalid votes were 1.07 million, or nearly 350,000 more than the number of votes for the 59-year-old Sabahi. El-Sissi's win was never in doubt, but the career infantry officer, also 59, had hoped for a strong turnout to bestow legitimacy on his ouster last July of Egypt's first freely elected president, the Islamist Mohammed Morsi. However, el-Sissi's campaign said turnout nationwide was around 44 percent, even after voting was extended for a third day Wednesday - well below the nearly 52 percent won by Morsi in June 2012. In his final campaign TV interview last week, el-Sissi set the bar even higher, saying he wanted more than 40 million voters - there are nearly 54 million registered voters - to cast ballots to "show the world" the extent of his popular backing. El-Sissi supporters held all-night celebrations in Cairo, with several thousands gathered at the central Tahrir Square, birthplace of the 2011 uprising that toppled longtime autocrat Hosni Mubarak. They waved Egyptian flags, el-Sissi posters and danced. There were similar celebrations in the Mediterranean city of Alexandria and a string of other cities north of the capital and in the Oasis province of Fayoum southwest of Cairo. 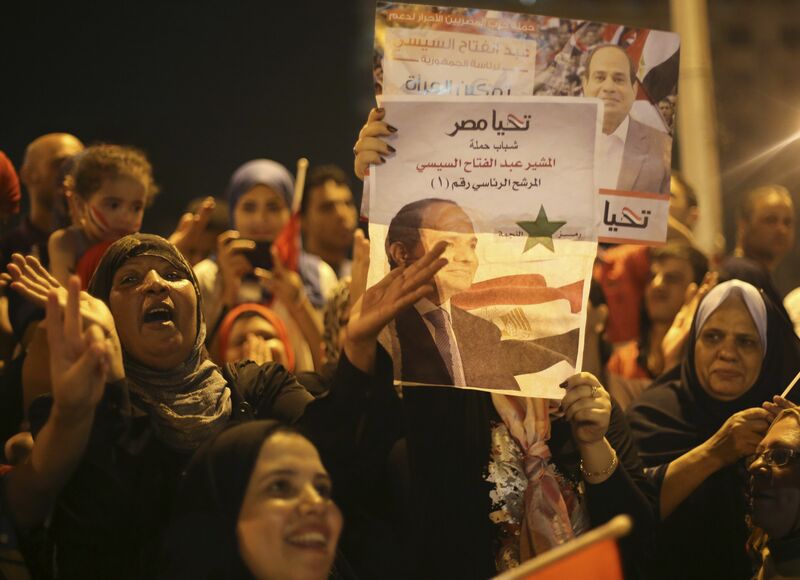 Critics said the lack of enthusiasm at the polls was in part due to apathy among even el-Sissi supporters, knowing that his victory was a foregone conclusion. Others said it showed discontent with el-Sissi, not just among his Islamist foes but also among a broader section of the public that believes he has no concrete plans for Egypt's woes and fears he will return Egypt to the autocratic ways of Hosni Mubarak. El-Sissi "enjoys the backing of the powerful armed forces and the Interior Ministry, as well many politicians and former Mubarak officials now making a comeback," the Reuters news agency points out, adding that he "is seen by supporters as a strong figure who can end the turmoil that has convulsed Egypt since the revolution that ended Mubarak's 30 years in power. But critics fear he will become another autocrat who will preserve the army's interests, and quash hopes of democracy and reform aroused by the protests that swept Mubarak." The tepid turnout was particularly embarrassing because the government and media had been whipping up adulation for el-Sissi over the past 10 months, depicting him as a warrior against terrorism and the only person able to tackle Egypt's economic problems, high unemployment, inflation and instability. El-Sissi's supporters in the Egyptian media have been in a panic the past two days. Political talk show hosts and newscasters urged people to vote, warning that otherwise the Brotherhood will be encouraged to step up its challenge to the new government. Prominent TV talk show host Amr Adeeb angrily said that by not voting, Egyptians might as well "go directly to the prison and return Mohammed Morsi to power." "Tell him, 'Your Excellency, President Mohammed Morsi, please come out and rule us,'" he said. The abrupt decision by the election commission to add another day of voting Wednesday raised complaints that authorities were tipping the playing field in el-Sissi's favor. U.S.-based Democracy International, which had been observing the vote, said the extension "raises more questions about the independence of the election commission, the impartiality of the government, and the integrity of Egypt's electoral process." It said its observer teams outside of Cairo had ended their mission as scheduled on Tuesday. Some other international monitoring teams also left the country, since they had only planned for two days of voting, though EU monitors stayed on. Sabahi, el-Sissi's only opponent in the race, protested the extension, saying it aimed to "distort" the will of the people. His campaign pulled its representatives from polling stations Wednesday in protest against what it called a campaign of intimidation and arrests of its campaign workers. He, however, refused to bow to pressure from his camp to withdraw in protest, arguing that staying in the race qualifies him to "fight future battles." Sabahi's spokesman, Hossam Moenis, told ONTV network that a member of the campaign has been referred to a military tribunal. "We are digging a channel for democracy ... in the face of an undemocratic project," he said. "The same mentality that we thought we managed to topple on Jan. 25, is back and ruling" - a reference to the start of the 18-day, anti-Mubarak uprising in 2011. Only a handful of voters, or none at all, were at polling centers in multiple districts toured by The Associated Press reporters Wednesday. At some, music played and kids painted Egyptian flags or el-Sissi's name on their faces as the occasional voter drifted in. TV images beamed from more than a dozen locations across Egypt showed similar scenes. "People are lazy, depressed or frustrated. They knew what the result will be even before the vote," said Amani Fikry, a manager in a privately-owned company. "They are exhausted from three years of constant troubles." "Sissi doesn't need a program," said one, Mohammed Hussein. "We just want security." Morsi's Brotherhood supporters and other Islamists boycotted the vote and scattered protests by Morsi supporters were quickly dispersed by security forces. In Fayoum, the province southwest of Cairo, riot police fired tear gas after protesters hurled stones and fire cracks while marching and chanting slogans against elections. Along with Islamists, some of the youths who took part in the 2011 uprising that toppled Mubarak either stayed away from the polls or supported Sabahi. "Where are the youth? What do they want? Do they want to destroy Egypt?" Said Sayyed, a laundry worker in his 70s, said of the boycott.